Castleford Tigers head coach Daryl Powell admitted his side have got to cut out their habit of conceding some soft tries, but claimed that aspects of his side’s defending in the 43-26 win over Catalans Dragons was the best he had seen at the club. 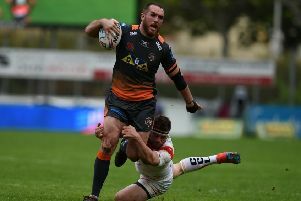 Much of the big praise coming the way of the table topping Tigers has been centred on their ability to score exciting tries, but Powell praised the other side of his players’ game - once they got over a poor start that saw them 14 points down. He said: “We got a response from the Salford defeat, but it didn’t look like it after 15 minutes. “We were slow out of the blocks and their big physical team got after us in the middle of the field. I thought we didn’t handle it at all. “But I thought we responded really well and as soon as we got good field position we looked dangerous. We caused them a lot of trouble and by half-time we had got ourselves a lead, which was great. “I thought we did some really good things. Some of our defensive work was the best I’ve seen since I’ve been at the club. “The line speed was phenomenal I thought at times. “Adam Milner and Paul McShane in particular just led the defensive response to last week, which was fantastic. Powell was less happy with the ease with which Catalans scored two of their four tries. He said: “We conceded a couple of softies, which we should be stopping, so that was a little bit disappointing. “We just need to cut these soft tries out. We’d been averaging 12 points conceded a game before and it’s shot up a little bit after that game. Powell acknowledged that the power of his bench worked well for him again with Junior Moors in particular proving an outstanding replacement. He added: “We’ve had a rotational policy that’s worked well for us and players coming off the bench have been great. “You’ve got to give due reward to the players who have started the game off. “But Junior Moors was probably the catalyst - or one of them - that kick started us. We’ve had Grant Millington and Matt Cook on the bench and they have done a really good job. “The bench has generally done a great job for us. “We’ve got a few players who are right up there at the moment as Man of Steel contenders, but definitely Junior Moors. “He’s been consistent and durable. “He’s been an interesting one. It took him a while to settle into the English game, but we saw the best of him last year. He finished outstanding and he had a big year, particularly the back half. “He looks fit. He’s a big man, 116 or 117 kilos, and he carries it pretty well. We had a kick return at the weekend and he’s back on play one, so was Millington.